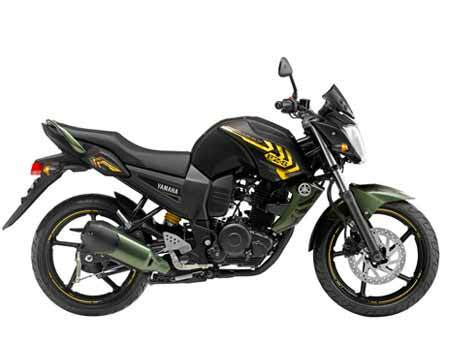 The Yamaha FZ changed the fortunes of Yamaha in India. It now features a host of mechanical and cosmetic changes and looks completely different. The FZ series is the most popular bikes for the Japanese two wheeler giant in India. The Yamaha FZ changed the fortunes of Yamaha in India. There are 7 models available in the FZ series of motorcycle. Each model has different technical specifications. This bike becomes an ideal bike for commuters and for vacationers. There are 2 versions of this motorcycle with 2 engine, 1 transmission, 1 fuel option and different ex-showroom price. There are 2 versions of this scooter with 1 engine, 1 transmission, 1 fuel option and different ex-showroom price. There are no versions of this scooter available. It has 113 cc engine, petrol as fuel and automatic transmission. There are no versions of the motorcycle available. It has 123 cc engine, petrol as fuel and manual transmission. There are 3 versions of this motorcycle with 2 engine, 1 transmission, 1 fuel type and different ex-showroom price. There are 2 versions of this sports bike with 2 engine, 1 transmission, 1 fuel option and different ex-showroom price. There are no versions of the motorcycle available. It has 1679 cc engine, petrol as fuel and manual transmission. My Yamaha bike insurance has already expired. Is vehicle inspection mandatory? Yes it is mandatory- Fix up an appointment for the inspection of your Yamaha bike. Do note; this can invite a nominal fee. If the insurance company chooses to offer you the coverage, you can make the payment and get the policy in hand. However, if you are lucky enough, inspection may not be mandatory. Yes-an online policy is very much valid. You can also renew your Yamaha bike insurance policy with a debit/credit biked or even through net banking. Although, for expired policies you will have to contact us for an offline renewal process. You should opt for a long-term or multi-year two-wheeler insurance plan for your Yamaha bike to enjoy pure convenience and be completely stress-free. You can save on premiums, eliminates the hassles of yearly renewals, skip the paperwork and avoid the gap in coverage since you are insured for an extended period.